Ice formations hang on trees at the Unteres Odertal national park near Schwedt, Northeastern Germany, February 15, 2012. I found this at a weather station when I was looking up the local weather (which I almost never have to do). WTF? How did that form?? Is there some kind of metal disc around the tree (such as are used here to stop possums climbing them) that has had the near-freezing water condense on it, then trickle down to form the skirt? 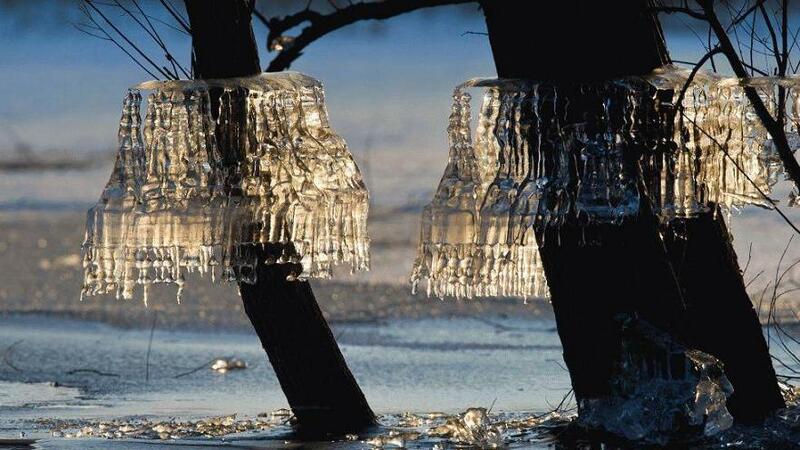 Or does some weirdo have a fetish for trees in ice tutus? High, still water with freezing weather - followed by lower water levels and melting ? Ahh, yeah, I get it. Freaky. Chandeliers on their trees. What will they think of next.